Small Bits of Paper: Wool You Be Mine? We got heaps and heaps of snow today! My youngest was supposed to have an out-of-town hockey game but it was cancelled due to the weather so the rest of the family decided to go and see "Lego Batman". I decided to enjoy some quiet time all to myself in my craft room. The dog and two cats spent most of the time with me, but other than one hissing match between the cats, they didn't disturb me at all. I feel so refreshed and renewed! I made a couple of cards, and this is one of them. 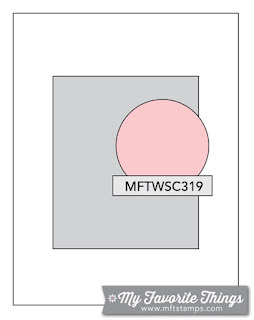 I made it with the latest MFT Card Challenge (Sketch #319) in mind. Originally, I had green grass but I just didn't like the look so I decided that my grass would be pink! I'm much happier now. For those of you who also had snow, happy shovelling! And may all of you have a wonderful week ahead. This card is adorable. I think the pink grass is a great idea - it adds to the whimsical nature of the card. Wonderful ink blending as always. Cheers! 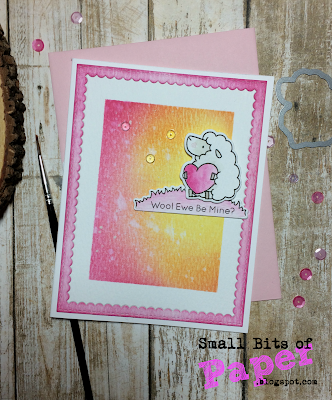 LOVE the card, I like anything to do with sheep and this is perfect, even the pink grass is just right. So happy to hear you feel rested. We received some snow and then it change to hail! Wow!! That was yesterday but today it feel a little cold but its not that bad. Super cute card my friend!! We have been having the strangest weather this year. Last week we had 5-7 inches of snow and this week its in the 30's. Expecting the mid 40's over the wknd. Crazy! I've had my eye on those sheep, Kate, and what you've done may push me over the edge. This card is just so cute and I approve of pink grass.